A new 11% Cr ferritic steel from Tenaris, Thor™ 115, can provide a proven alternative to grade 91 (9 % Cr) in typical applications, but also, thanks to its lower steam oxidation rates, promises superior performance in more demanding situations, at temperatures above 600°C, significantly extending the range of application for ferritic steels, potentially up to 650°C. Competitiveness in the power generation market is nowadays based on increasing efficiency and flexibility. Improving the efficiency of combined cycle plants requires heat recovery steam generators to operate at increased steam temperatures (see Graph 1), while increased flexibility requires components to be able to withstand frequent load changes (fatigue). This poses new challenges for materials used in construction, which need to be able to maintain stable properties over long periods and under changing conditions. Furthermore, a new generation of gas turbines, H and J class, has also required the industry to look beyond the limitations of currently available materials. Creep-strength-enhanced ferritic (CSEF) steels, eg 9% Cr alloys, are particularly attractive for manufacturing a wide range of components thanks to their relatively straightforward and well established manufacturing procedures and desirable properties in terms of formability, weldability and response to heat treatment. These steels show good thermal conductivity and limited thermal expansion, thus resulting in less severe fatigue cycles than those experienced by austenitic materials. Moreover they possess the high strength and long-term stability needed to ensure reliable design. As steam temperatures increase, however, the limiting factor in selecting this class of material is oxidation resistance rather than strength, and in practice this means that the maximum temperature at which 9% Cr materials can be used is below 600°C. Steam oxidation is in fact a critical issue in power plants, where the formation, growth and spallation of oxide scale on the steam side may impair plant operations. Taking this into account, Tenaris has developed a new CSEF martensitic steel for power generation applications, called Tenaris High Oxidation Resistance (Thor™) 115. This combines good steam oxidation resistance with long-term microstructural stability and creep strength, and is suitable for applications up to 650°C. The material has been recently approved in ASME BPV Sec I and has been assigned Code Case 2890. The alloy composition of Thor™ 115 was developed so as to achieve an improvement over the popular ASME grade 91, using similar alloying principles, but aiming at improved performance. The chromium content was increased to improve steam oxidation resistance by promoting the formation of a Cr-rich, compact and passivating scale when exposed to high temperature steam. Cr also provides solid solution strengthening. The Mo and Nb contents were lowered, to prevent the formation of unwanted secondary phases, such as Laves and Z-phase, after ageing at service temperature. Thor™ 115 develops a fully tempered martensite microstructure after normalising and tempering, and meets the same hardness and tensile properties as grade 91, as well as having similar time- dependent rupture strength. Table 1 shows the target chemical composition of Thor™ 115 and, for comparison, that of Asme grade 91. Creep testing on industrial heats has been performed, for almost 2 million test hours. The longest tests have run for over 50 000 hours, enough to allow extrapolation to 100 000 hours at service temperatures (up to 650°C). In order to assess steam oxidation rates, polished Thor™ 115 and T91 test coupons were exposed to pure steam at 600°C and 650°C (at Oak Ridge National Laboratories). The resulting specimen mass change as a function of time is shown in Graph 2. The mass gain of Thor™ 115 is significantly less than that of T91 grade, and increasing the temperature above 600°C does not result in an increase in the oxidation rate for the 11% Cr alloy, unlike the 9% Cr material. For the Thor™ 115 specimens, the inner oxide thickness is actually lower at 650°C than at 600°C or 625°C. This is thanks to the greater amount of Cr available for diffusion towards the surface, which means that the inner oxide on the Thor™ specimens becomes richer in Cr, resulting in a more compact and protective oxide scale. Physical properties were also assessed. Graph 3 shows thermal expansion (measured by dilatometry) and thermal conductivity (measured by means of the transient plane source method). The properties of Thor™ 115 are, as expected, in line with other ferritic grades: compared with austenitic materials, thermal expansion is significantly lower and thermal conductivity is much higher. Thanks to the comparable alloying and strength, components can be manufactured from Thor™ 115 using similar industrial processes to those that are well established for ASME grade 91 parts. Forged flanges and fittings have been produced, for example, using procedures that are well established for the manufacture of ASME SA182 F91 grade forgings. Thor™ 115 is especially suitable for use in heat recovery steam generators thanks to the availability of long length tubes (up to 26 m), and the possibility of finning them to improve heat transfer. Finning trials were performed, applying solid and serrated austenitic and ferritic fins by means of high frequency resistance welding. A complete circuit made up of Thor™ 115 components has been manufactured and tested under real operating conditions at an existing combined cycle power plant in Italy, using extracted superheater steam, which is reheated inside a Thor™ 115 circuit up to 615°C. Welding trials have been performed on Thor™ 115 tubes and pipe using welding procedures already qualified for ASME Grade 91 steel components. In welding Thor™ 115 to itself, grade 91 filler material was used since it can meet the necessary strength requirements, and guarantees a completely martensitic microstructure. Extensive testing at different workshops has demonstrated the applicability of long-established and proven welding procedures to components manufactured with Thor™ 115. In summary the new Tenaris CSEF alloy, Thor™ 115, has been extensively characterised in terms of mechanical and physical properties and time-dependent performance, and this has demonstrated stable and reliable behaviour. Long-term rupture strength is similar, or slightly superior to that of grade 91, and physical properties match. Welding procedure qualification was successfully achieved using established practice employed with grade 91 components. Steam oxidation testing, both in laboratory and in field, confirms that this higher Cr material exhibits a very slow oxidation rate compared with 9% Cr counterparts. 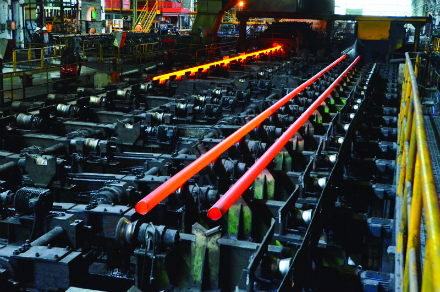 This, combined with consideration of its mechanical and physical properties, confirms that Thor™ 115 extends the range of use of ferritic steel above 600°C and as well as being a superior replacement for grade 91 in all its typical applications and can also be used in more demanding applications, where a limitation on temperature is enforced by steam oxidation.